Thank you, Silk, for sponsoring this post. As always, all opinions are 100% my own. 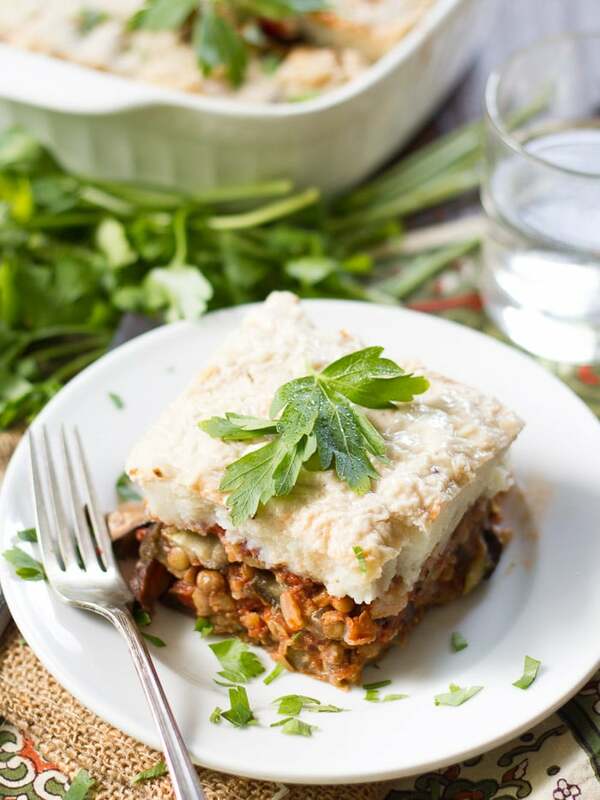 This vegan eggplant moussaka is made with tender slices of roasted eggplant and zucchini, layered with smoky lentils, and topped with a mashed potato crust slathered in creamy vegan Béchamel sauce. Oh moussaka. I love this dish and for a long, long time, it eluded me. Back before the internet, or at least back before I knew what to do with the internet, like in the late 90’s, I’d end up at restaurants where I tired all kinds of random dishes that I LOVED but had no idea where to find more information on. That’s how I had my first taste of vegetarian eggplant moussaka. I think it was the only vegetarian thing on the menu at the particular place I was having dinner, but that was fine, because it was awesome. In all honesty, I can’t remember what was in that moussaka I tried all those years ago, just that it was a big plate of saucey eggplanty goodness. I’m pretty sure it wasn’t vegan though. So here I am, on my very own internet website, with my very own vegan eggplant moussaka, and the timing couldn’t be more perfect. Right about this time of year is when all the produce is abound, and it’s finally cool enough to turn on the oven and cook that produce, which I couldn’t be happier about. 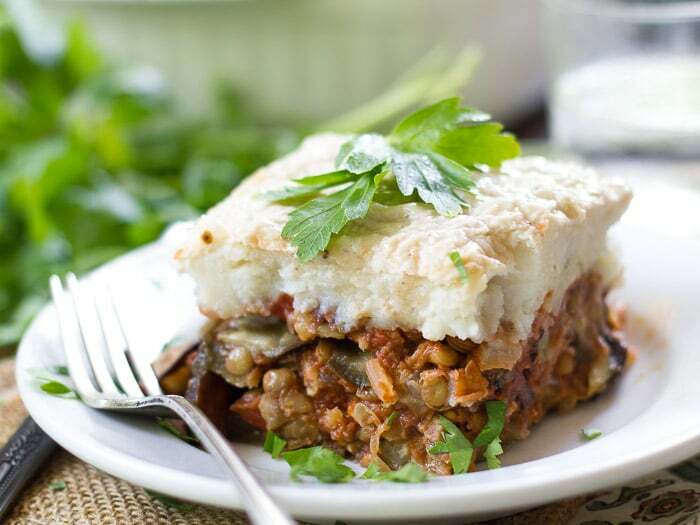 My moussaka uses lentils and walnuts in place of meat, layers of eggplant and zucchini, and a cozy mashed potato crust topped with vegan Béchamel. I was actually a little nervous about that last part, being not really sure if the potato Béchamel layer would taste good without the traditional feta cheese you find in traditional moussaka, or whether the sauce would do it’s thing without dairy milk. It couldn’t have turned out more perfectly though. I used Silk Unsweetened Cashewmilk and cooked it up just as I might if I were making a conventional Béchamel. It was deliciously thick and creamy and made a perfectly sturdy topping for this luscious veggie bake. 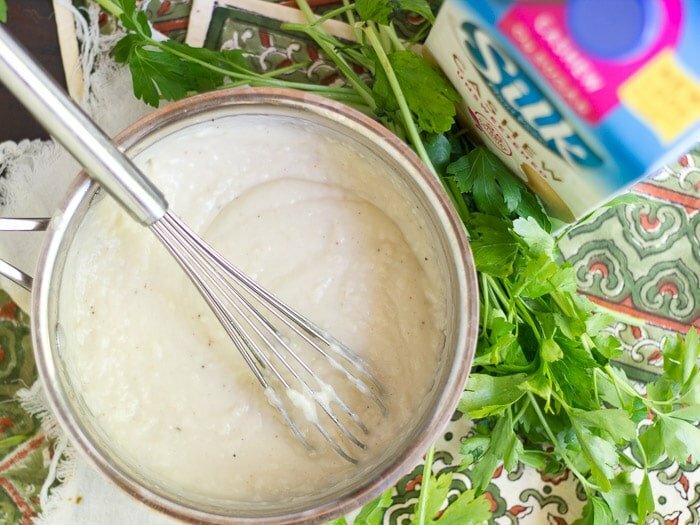 To find out where you can get some Silk Cashewmilk for this recipe using Silk’s store locator. For more dairy-free inspiration, sign up for Silk’s newsletter. Begin preparing the lentils by placing them in a medium saucepan and covering with 3 cups of water. Place over high heat and bring to a boil. Allow to cook, uncovered, until lentils are almost done, but just a bit firm at their centers, about 30 minutes. Drain any excess water. While the lentils simmer, begin preparing the veggies. Preheat oven to 400°. Slice eggplant and zucchini into long slabs, about 1/4 inch thick. Brush with olive oil and arrange on baking sheets. Bake until lightly browned and just beginning to soften, about 15 minutes. While the veggies bake and the lentils cook, place potatoes into a medium pot and cover with water. Place over high heat and bring to a boil. Cook until very tender, about 15 minutes. Drain into a colander and return to the pot. Mash with a potato masher, and add cashew milk and garlic. Season with salt and pepper to taste. Add a splash or two more of cashew milk, if needed. Once the lentils have finished simmering, and are drained, coat the bottom of a medium pot with olive oil and place over medium heat. Add onion and sauté until soft and translucent, about 5 minutes. Add garlic and sauté 1 minute more. Add lentils, tomatoes and red wine. Bring to a simmer and allow to cook until liquid is reduced by about half, about 4 minutes. Stir in tomato paste, paprika, cinnamon and cloves. Cook just until thickened up a bit and heated throughout, about 2 minutes. Stir in walnuts and season with salt and pepper to taste. To prepare the Béchamel sauce, place olive oil into a small saucepan and place over medium heat. Whisk in flour and bring to a simmer. Lower heat and allow to simmer, whisking almost constantly, for about 3 minutes. Whisk in milk and bring to a simmer. Allow to simmer over low heat until very thick, about 10 minutes, whisking frequently. If you turned off the oven after baking the zucchini and eggplant, turn it back on, and preheat it to 400°. Arrange about a third of eggplant and zucchini slices in the bottom of a 9 x 13 inch baking dish. Top with about half of lentil mixture, then arrange another third of the zucchini and eggplant layers over lentils, followed by remaining lentils, and then a final layer of zucchini and eggplant. Spread potatoes over zucchini and eggplant, and then spread Béchamel sauce in an even layer over potatoes. Place in the oven and bake until the top begins to brown and you see some bubbling around the sides of the dish, about 30 minutes. Remove from oven and allow to sit for a few minutes before serving. I need this in my life. It reminds me a bit of a vegetarian shepherd’s pie I invented for myself that used cheese on the mashed potato topping. Now I can adapt this for my shepherd’s pie, too! Thank you! I saw this post and just had to check it out. I am Greek and grew up eating my moms homemade traditional Moussaka. I’m actually not much of an eggplant lover so my moms is the only one I ever ate because not only did she cook it just right but she didn’t put the traditional cinnamon and nutmeg since we all preferred it without. Funny part is that a few months ago she asked me to help make a vegan version because she was making hers for our big family dinner and wanted to have both available. So I started veganizing it. Even funnier is that it’s on my list for one of my Silk posts! LOL. My moms however is very different, she makes hers with sliced potatoes, and traditionally it doesn’t even have that but she added it because we don’t love all eggplant, no zucchini and actually traditional moussaka does not have feta. Just béchamel, so you are good there! I love that you made it your own, looks delicious! I want to try your recipe too! Oh wow! That’s so cool and I’m kind of jealous that you got to enjoy your mom’s traditional version growing up! I think that restaurant version I had way back when was made with sliced potatoes and I loved it. :) I can’t wait to check out your recipe! 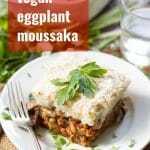 I had to make this the day after I got the email because, well, vegan moussaka! Of all your recipes I’ve tried, this is my favorite! The spices are perfect and the whole thing is absolutely delicious! Next time I’ll play with it a little more, but tonight I made it just as written. My husband and my meat-loving dad also loved it. This recipe will become one of the few that I’ll serve to guests at my B&B on their first night. Thank you! Hi Traci! Yay! Glad you enjoyed it! That’s so cool that you’ll serve it to your guests – what a nice treat for dinner on vacation. :) Thanks so much!! Can I make this ahead of time and cook it the next donor will that ruin it? I think it would be okay to assemble everything and then cook it the next day, but I haven’t tried, so I’m not completely sure. I’d love to hear how it works out if you try! This looks fantastic! Do you think a cauli mash as opposed to potato mash would work as a substitute? Thank you! And I’m not sure a cauli mash would work. The potatoes firm up quite a bit during cooking, and I can’t really say whether cauliflower would do that. I could see a white bean mash, maybe like a simplified vegan version of this working out nicely. Hello! I am wanting to cook this for our Christmas gathering but prepare the day before. Did you try this and if so…did it turn out well? I haven’t tried prepping this ahead, but I think it would work! I’d love to hear how it turns out if you try it! Honestly, it tastes even better reheated, so I intentionally make it in advance! 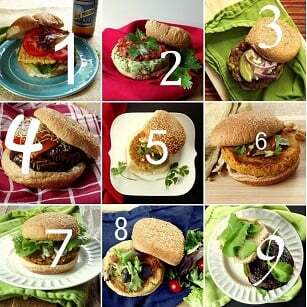 I LOVE this recipe – made it last night for the 3rd time! So delicious! The only thing I found was the bechamel required more of the cashew milk when used with a gluten free all purpose flour. I also added pistachio nuts and scraped carrot to the lentil mix. A real crowd pleaser. Thanks! I’m so glad you enjoyed it!! And good to know about the gluten-free flour! I am making it tonight, but i dont have red wine so i splashed a little port in it! I am also using sliced potatoes. Also trying out a vegan cheese sauce over the potatoes. I hope it works out! That all sounds delicious! I hope you enjoyed it!! I’m so glad you’re enjoying it and I LOVE the idea of using whole cloves – I’m trying that next time! Thanks Lainey! One of my top 3 favorite recipes! Thank you! I’m so happy to hear it!! Thanks so much Jodi! Would love to try this! Do you think the casserole would freeze well- in either its baked or pre-baked form? Thanks! I think so, but I haven’t tried so I can’t say for sure. My guess is that baked would work best! 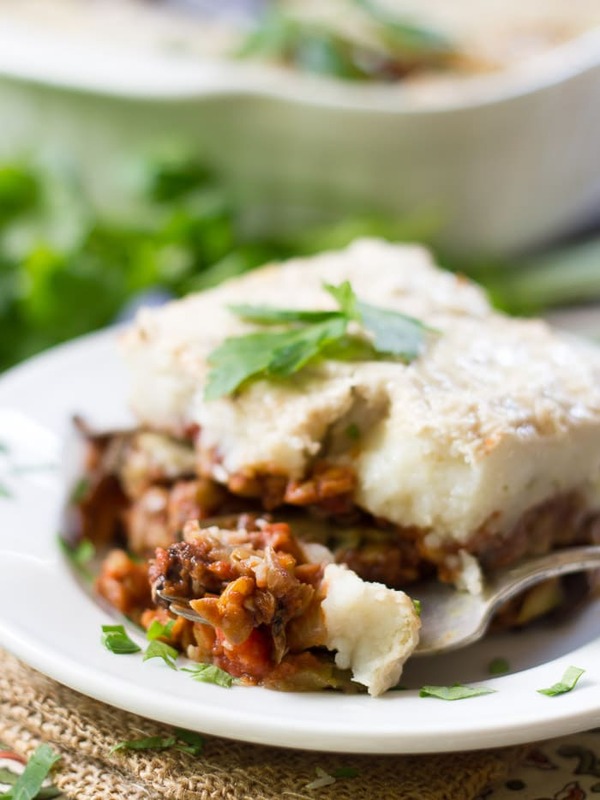 I studied abroad in Greece and fell in love with Moussaka. I really loved this recipe. The walnuts were a really nice touch and they added the perfect amount of salt and crunch to the dish. My moussaka wasn’t the prettiest, but it brought back some great food memories. I’ll definitely be making more of your recipes. Yay! That’s wonderful to hear! Thanks Alex!